We are welcoming two new exhibitors to the Garden Festival at Powderham Castle this year both of whom take their inspiration from Nature : West Country artists Karen Thomas and Anne Mortimer. Karen describes herself as an artist who ‘creates contemporary, nature-inspired art to brighten your day and your home’. 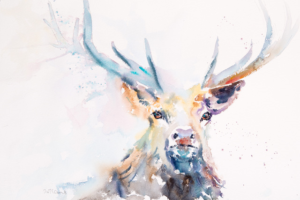 An up-and-coming artist based in Devon, she has two successful solo exhibitions under her belt and participation in many others across the South West in prestigious venues, including The National Trust. Bold, passionate use of colour and captivating portrayal of movement are what most attracts people to Karen’s work. Karen’s work was recently featured in Country Living Magazine. Karen will be taking commissions at the Festival and says she regards it as a privilege when asked to recreate a much-loved pet or special scene expressively. Anne Mortimer is well known for her illustrations of cats. During the 1980’s she also published books including the well loved and celebrated Christmas Mouse and The Owl and the Pussycat. Anne’s new collection of prints is inspired by the wildlife she sees whilst out walking in the beautiful South Hams in Devon. The stunning backgrounds to the pictures are hand finished in gold leaf. Anne lives in South Devon with her dog Maisie. One-Third Off Tickets to Toby’s Garden & Harvest Fest at Forde Abbey!